I am posting this as a heads up. The large asteroid 2 Pallas and asteroid 7 Iris are at opposition on April 6 and April 5th respectively. Pallas has already peaked in brightness at 7.9 mag as of March 20, while Iris will peak at 9.4 magnitude. Pallas won't dim significantly over the coming weeks, but Iris will begin dimming more rapidly at the end of April. Pallas will reach an apparent diameter in the 0.4" range. Stellarium's number for Iris' apparent diameter looks high so I am not posting it until I check it. This is not a favorable opposition for either asteroid. I missed the last favorable ones in 2017. The next favorable oppositions are in 2028 for both. Iris will reach 7.0 mag in October of that year. Pallas will reach nearly 6.5 mag in March of that year and ~0.5". Thanks for the heads up. I've never seen 2 Pallas--looks like this might be my best chance. I caught 7 Iris a couple of years ago thanks to a heads up like this one when it happened to be passing close to M80. At that time it was magnitude 9.1. I was able to catch them both last night, through sucker holes between clouds that were not supposed to be there. Even had the novelty of ice pellets raining down on me while observing...those weren't supposed to be there either. It is a pretty bad night when only three targeted objects are logged and two are asteroids. I should have followed my gut about the weather based on what I could see towards the mountains all day, and a thin band of cloud offshore in satellite view in the afternoon that looked like it might arrive that night. My gut forecast was spot on; the models missed by a mile. I observed Pallas first, identifying it through my 2.3x binos in averted vision through/between thin cloud. It was noticeably dimmer than the 7.1 mag star approximately to the north of it. Switching to the 20" it appeared to have a yellow hue at 278x. I put the seeing as somewhere between 2 and 3/10 Pickering for the 20", poor at about 2 arc seconds, so I couldn't really separate the airy disk from the diffraction rings of stars. I did observe some subtle but consistent differences though vs. 8th mag comparison stars. I used 357x at times which indicated Pallas was borderline non-stellar, primarily because it appeared more stable than the shattered diffraction pattern of the 8th mag stars, and there was a smoothing effect to the brighter central portion of the pattern that was absent for stars. My calculations show a diameter of ~0.39 arc seconds, so I would need some decent seeing to resolve it. I had a look at these last night, without the ice pellets! At 387x in the 32” Pallas was a non-stellar disc. It appeared bright, around magnitude 8. Sky Safari 6 with the extended star database made orientating the star field and locating Pallas easy. Plus the fact everything else was stellar and Pallas appeared as a disc. Iris looked stellar to me again at 387x. Not quite as bright as Pallas, but still easy to split from the fainter star field. I observed Pallas in December 2017 when it was swinging through Fornax. I was in Baja California at the time where the climate is Fornax-friendly. This was my first ever sighting of this wee asteroid. Saw it with a TV85. It took several checks of the map to confirm (and I had to stop and convince hotel security that I was really looking at stars and not launching grenades). There was a lot of chatter on the two way radios that night. I confirmed both had moved on the following night, not that I doubted my ID's. Stellarium's developers have confirmed the problem I noted for Iris. After discussion with them I tracked it down to a bug I identified in the apparent diameters used for many/most asteroids. For many/most asteroids Stellarium actually calculates a radius based on absolute magnitude (a supplied parameter) based on a formula that assumes a 0.150 albedo and calculates diameter...not radius. Since it was using this value as a radius the typical error was 2x. They will be fixing that. Some of the asteroids/dwarf planets etc. have actual albedo entered, which is often much higher than 0.15 and sometimes in the 0.7+ region (mostly outer solar system bodies/dwarf planets.) This actual albedo is then used to calculate radius as above. Some of these were calculating correctly such as Pallas, some not based on my hand checks. This will probably get sorted out--there was something odd about the multiple locations of the .ini files too, and that might be part of what they will be addressing; I'm unsure of the latter. Iris was off because it not only was having its radius inflated by the 2x error, but it also has a much higher albedo, 0.277 than was being assumed by the default. That further inflated the apparent diameter. I don't know if they will be getting more updated albedo's or actual radii for the .ini file. When I see a number that doesn't look right, it usually pays to check it out. The school of hard knocks has taught me that when I don't, I often get burned. Yesterday (april 4th) was my first look at Pallas. Using stars nearby, I estimated it's magnitude at about 8,5 more or less 0,03. Can someone confirm my observation? Estimating magnitudes is something I'm just learning to do. Edited by InkDark, 05 April 2019 - 08:49 AM. Thanks for the update, sorry you couldn't get obliging weather, or seeing rather. Iris I can't even remotely consider as it's in Corvus and that's just too way low for me to get anything like a decent Pickering number. Pallas though, maybe - if I stay up late enough. Looking right now at 10:00 EST. Is Pallas the starlike object very close to Muphrid? I was looking about 4 days ago and didn't see a star that close I don't think. Wait...scratch the above question. Is Pallas the 2nd closest object to Muphrid? I didnt notice the dimmer object at 12x in the 66mm at first. Bumping up the power brought a dimmer closer object into view. I drew a picture at 100x, hopefully tomorrow it's clear enough to look again. Edited by kkrepps, 10 April 2019 - 09:45 PM. I drew a picture at 100x, hopefully tomorrow it's clear enough to look again. Same here. It's the first time I'm asteroid hunting and it helped me to learn a few tricks. It's the fist time that I sketch. Having lot of fun exploring in detail a small part of the sky as oppose to the usual slewing all over the place looking for bunches of DSO. Here's the section on asteroids from the April 2019 Celestial Calendar. As it heads northwestward through Boötes this month, the main belt asteroid 2 Pallas shines at eighth magnitude. The second asteroid to be discovered reaches opposition for North American observers on the night of April 9th. On April 10th, 2 Pallas passes just two arc minutes east of the third-magnitude star Muphrid (Eta Boötis) and approximately five degrees southwest of the first-magnitude star Arcturus (Alpha Boötis). A finder chart can be found on page 48 of the April 2019 issue of Sky & Telescope. Asteroid 7 Iris is visible as a ninth-magnitude object as it travels northwestward through northeastern Corvus. This main belt asteroid, which is less than half the size of 2 Pallas, reaches opposition on April 5th. A finder chart appears on page 50 of the April 2019 issue of Sky & Telescope. Other asteroids brighter than magnitude +11.0 reaching opposition this month include 405 Thia (magnitude +10.5) on April 20th in Hydra and 44 Nysa (magnitude +9.9) on April 25th in Virgo. Click on http://www.asteroido.../2019_04_si.htm for information on asteroid occultations taking place this month. See https://www.curtrenz.../asteroids.html for additional current information on a number of asteroids. The RASC Observer's Handbook 2019 lists the date of the opposition of Pallas as being April 10th at 1:00 UT (April 9th at 9:00 p.m. EDT) so that's what I used. Astronomy also has opposition occurring at 9:00 p.m. on April 9th on page 39. I've seen the April 6th date at some online sites and also in Sky & Telescope. So which date is correct? Due to the weather, Pallas will be long gone from that section I was looking at before a revisit. But, I'm going to revisit that spot anyway and compare the drawing. About a week ago I revisited a section where I thought I previously saw Pallas. Everything was the same. I had mistaken a star for Pallas. Then went on and found what I thought was Pallas. The next night, the sky cleared for a few hours. I went back and in an instant realized that what I then thought was Pallas was missing! The drawing hepled to confirm my observation, this time without a doubt. I then noded the scope a few arc minutes over and there it was, a foreign objetcs in the star field according to the map. 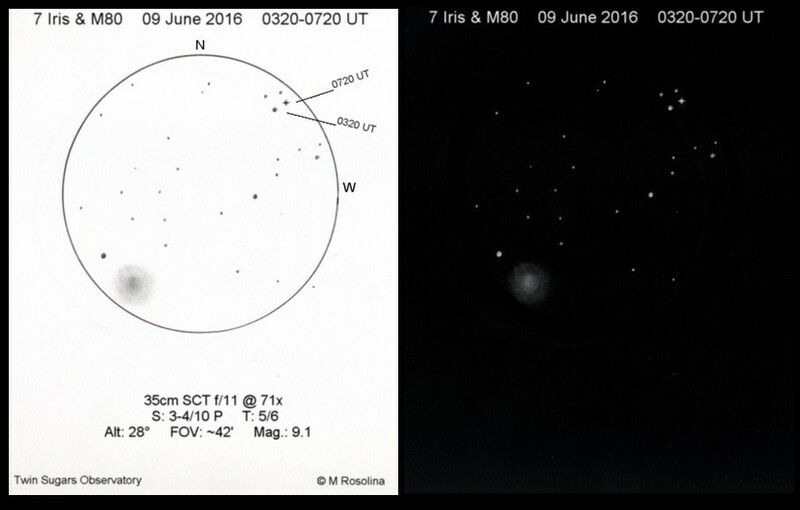 Those observations thought me a lot about searching, sketching and even the view in my scope (Dob). Last time I observed the asteroid was satruday night. My estimation was at between 8 and 9 magnitude. Orion Q70 Eye Pieces, and similar ones.